There is a capacitor between +5V and GND which should help keeping away any voltage noise. You can use anything: I had a 0.1uF tantalum cap that I used. The evil thing with not putting bypass (or decoupling) caps in your designs is that you may never find out why they might behave erratically. There is also a push-button, which is optional. You might think it would be connected to the reset pin but it is connected to the CLK - I wanted to be able to manually clock the Z80 to see if it worked before hooking it up to Arduino. For the same reason, every Z80 control input pins has a weak pull-up resistor. That should make it "alive and kicking" right off the bat without the need of anything else externally driving it. Now, the most interesting extension to the design is a tri-state bus detect. Z80 occasionally puts its address and data buses into "High-Z", or tri-state, and I wanted to detect that (it also lets most of its control pins to Z, but I was content to detect only the major buses.) There are 2+2 resistors (each 10K) making up a weak resistor divider network connected to pins D0 and A0. That way, whenever Z80 releases its data or address bus, the pins will assume 2.5V pulled by resistor dividers. Since both buses are connected to analog input pins, Arduino will be able to read the voltage and clearly detect that they are not 0V or 5V (logical 0 or 1) but somewhere in between. After verifying that my 25-year old Z80 chip from my parts bin is still working (! ), I connected it to an Arduino Mega board. Mega is really useful here since it hosts more I/O pins than you'd ever need, runs on +5V and therefore needs no voltage level translators to talk to Z80. The time is to write some software. Being a software engineer by trade comes in really useful since many great hardware hobbyists totally drop the ball when it's time to blow a breath of life into their designs and write code, so they skim over that part. The Arduino software that runs this dongle can be downloaded here. Functionally, this sequence does not make much sense, but it lets us test several things: Instruction prefix IX, undocumented opcode, LDIR loop, HALT; then by inserting a NMI and INT at certain places we can trace what's going on when CPU is servicing those interrupts. Assemble it and zmac will generate several output files. Open an Intel-style hex file which will show the code in hex; copy all and paste it into the Arduino serial terminal. The code evolved over time and so did the variables and multitudes of situations that can be set up by cleverly combining those values. In fact, this blog probably does not show the most up-to-date software version. As it runs, the trace program counts clocks and, by setting those variables, you can toggle specific control pins at determined times. For example, if you want to issue a NMI at clock 20, you would do "s 6 20". You can optionally dump what's happening on both clock phases and not only on the positive phase (variable #0). Variable #1 will show or hide memory refresh cycles that accompany M1. Start the trace by issuing a command "r". The Arduino starts the clocks and issues a RESET sequence to Z80 after which your code runs and bus values are dumped out. Notice the tri-state detection - when the address or data bus is being tri-stated by Z80, program outputs "--". In fact, data bus is being tri-stated most of the time! This is a dump from the start of the run. The dumps are normally longer, but you get the idea. Immediately we can see that Z80 uses 2 clocks of not doing anything externally after the reset. The clock phase can be high (H) or low (L) and dumping lows is enabled by setting a simulation variable #0 (by default, it does not dump low phases). T-cycles are being automatically counted starting at every M1 cycle. This greatly helps cross-checking each instruction against documentation. Input and output pins that are active are also tagged. 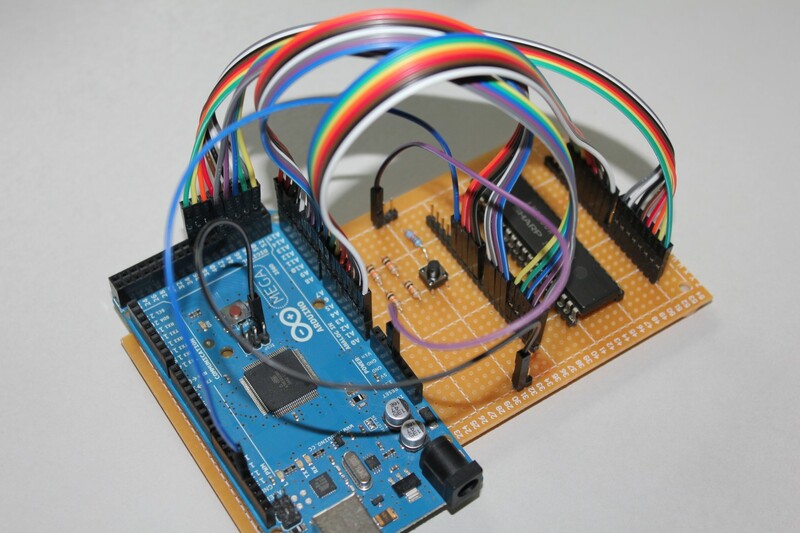 The Arduino simulator software provides data bytes to Z80 on memory read operations and stores bytes into the internal buffer on memory write operations. Simulating IO map is much simpler where variable #12 can be used to push an arbitrary IORQ vector when needed. Overall, the dongle itself and the options implemented by the Arduino software provide a powerful way to examine and visualize Z80 behavior whether it is running undocumented opcodes or responding to a sequence of external control pins like interrupts, bus requests etc. If you've found this interesting, you may want to check my other post where I documented some of the Z80 behavior which I've found less known. This is great! How much feedback have you gotten? I registered but didn't get an activation email. I was getting too much spam, so I tightened up the filters on the blog sites, Mikhail. People mostly email me and we have email conversations. I'm trying to do a similar thing: I'm connecting a Z80 to a Teensy (an Arduino mega compatible), which in turn is connected to the same SRAM wired to the Z80, and to an SD card interface. The idea is to use DMA (BUSRQ low) in order to load into SRAM a boot file, and subsequently start the Z80 via a RESET. 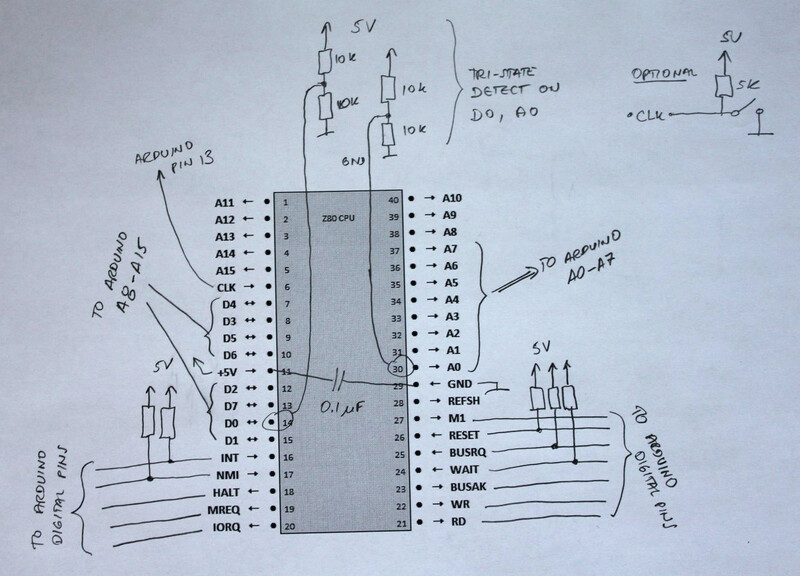 My problem is that I cannot manage to put the BUSRQ pin LOW (this pin is connected to a digital I/O pin on the Arduino): I've noticed that in your schematics you've put pull-up resistor on each Z80 input pin, but that those resistor does not appear in the photos of your final project. Should I also put them on my Z80 inputs, in order to making those pin to ground, by writing a LOW value on the connected Arduino pins ? Thank you for your note - I have corrected the image to indicate that the other 5 pull-ups are actually located under the Z80 and cannot be seen. I have added weak pull-ups to be able to power up the board without having the Arduino attached. Then I can clock it manually using the push-button and check that Z80 is not dead. That definitely gets one variable out of the way. Although pull-ups are probably not needed once you have other means of driving the inputs, they would not hurt. In fact, they'd keep Z80 stable until your Arduino initializes its IO pins. Good luck and tell me how it goes! I'll put the pullup resistors, and I'll try to reset the Z80 before asserting BUSRQ to LOW (I'm running it at 8MHz, clocking it directly from the Arduino). Another question if I may: when the busses goes in high-Z, also the MREQ, IORQ, RD and WR control pin go high-Z right ? I am not quite sure - and it will be interesting to find out the exact sequence - if the Z80 will try to fetch/execute an instruction at address 0 first before latching the BUSRQ, so you might see an initial M1 read and the BUSRQ will be accepted at T=4. See the timing diagrams for BUSRQ. That means you really need to poll for BUSACK and it may take a few extra clocks. I would suggest not running at 8 MHz at first but toggling it tick by tick until you get things running, and then gradually crank up the frequency. Depending on your wires and connections, you might get too much noise on the lines to get it stable at 8. If you have an oscilloscope or a logic analyzer, you might be able to get a better feel on when the noise becomes an issue. I've finally managed to to boot the Z80 from the Teensy. The Teensy lowers the BUSREQ pin, isolate the Z80 from the circuit, loads an assembler binary to SRAM from an SD Card, and then resets the Z80. I'm now trying to use the Teensy serial as a Z80 peripheral, but the Teensy is too slow to respond to the Z80 queries. I'm thinking to use the WAIT pin in order to freeze the Z80 temporarily, in order to allow the Teensy to correctly get data from the Z80. The work you did here to annotate the machine cycles and T-states of all Z80 instructions was invaluable to me for my own Z80 emulator. Unlike most Z80 'functional' emulators, mine attempts to faithfully reproduce all of the Z80's timing states, meaning my emulator should produce the exact same captured M-cycle and T-state results as your Z80/Arduino project did for all Z80 instructions. I was especially impressed with your method for determining when the data and/or address lines were in a high-impedance state. Very nice! I was a bit disappointed that your published results only listed the captured clock high states within each clock cycle, so I couldn't tell exactly when a control status line changed state. For example, for standard M1 opcode fetch cycles, your results always show the /M1 status line active/low at T1, and the /MREQ and /RD status lines active/low at T2. But those results are a bit misleading: in fact all of those status lines are activated during T1 -- the /M1 status line is activated at T1 high, while the /MREQ and /RD status lines are activated at T1 low. If your results listed both the clock high and clock low states (a nicely designed option in your Arduino sketch), then I would be able to see exactly when those status lines changed state. 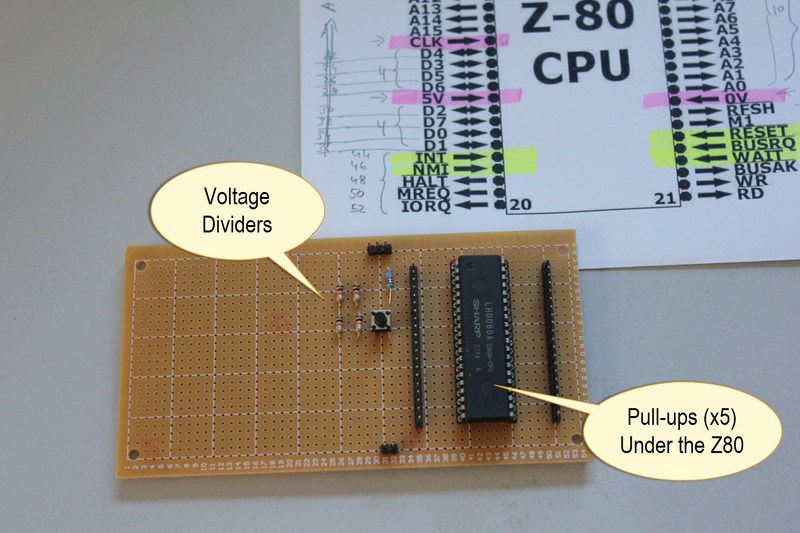 I really enjoyed your commentary on 'unusual' Z80 behaviors, especially your comments re the initial state of the Z80's registers and flags following power-on/reset. I performed similar experiments to yours and my results were 'almost' identical to yours. Like you, I confirmed that all registers other than PC and IR -- as documented, reset always clears PC and IR -- have all their bits set (0xFF or 0xFFFF), except for the F (flags) register. In my case the F register was initialized differently than yours. After executing a PUSH AF instruction immediately following power-on/reset, I determined the value of the F register by examining the data lines during the instruction's second memory write cycle. That value was 0x6C, not 0xFD as your results indicated. 0x6C is a pretty weird value: flags Z, P/V and the undocumented X and Y flags are set; flags S, H, N and C are reset). I don't which type of Z80 chip you were using for your experiments, maybe the NMOS and CMOS versions behave differently in this respect. Speaking of NMOS and CMOS versions: One problem I ran into doing my experiments was that single-stepping the Z80's clock or running the clock at very slow speeds worked fine on my CMOS Z80 chip, but produced incorrect results on the two NMOS chips I tried. For example, when I tried testing the instruction 'JR e' on an NMOS chip connected to a 1 Hz clock, the PC value following the instruction was incorrect, but was correct when I replaced the NMOS chip with a CMOS version. (And yes, I scoped the clock line and confirmed that the clock signal was clean, with fast rise and fall times.) I finally figured out why when I looked more carefully at the Z80's specs. The NMOS Z80 specs lists the maximum clock pulse low width and clock pulse high width as 2000 nsecs (2 usecs). For a clock with a 50% duty cycle, that translates to a minimum clock speed of 250 KHz. The CMOS Z80 specs list the maximum clock pulse low width and clock pulse high width as 'DC', meaning the CLK line can be held in a high or low state for an indefinite period. The moral of this story: if you're trying to capture Z80 state by single-stepping the clock or running it at very low frequencies, be sure to use a CMOS version of the Z80 chip; otherwise you might get bad results. I'll add a new reply to comment on the results of your other Z80 experiments. Thanks again for your fascinating and valuable work on the Z80's undocumented behaviors! Here's my second post to comment on your excellent findings re undocumented Z80 behaviors. I'm referring to your commentary on http://www.baltazarstudios.com/files/Z80-undocumented-behavior.htm. As I mentioned in my last reply, my findings matched yours exactly except for the initial state of the F register following a power-on/reset. You found the F register's value to be 0xFD (all but the C flag set); I found F's value to 0x6C. I just reran that experiment, using the exact same hardware as before, and this time the F register's value was 0x44 (Z flag (bit 6) and undocumented X flag (bit 3) set, all others reset). Not sure why the different result, as I was consistently getting 0x6C before. I'll continue investigating. My results match yours exactly. You mentioned, 'see the extra 2 (clock cycles) before pushing the PC.' Actually, there's only one. Zilog documents the RST instruction as requiring a 5 T-state M1 (opcode fetch) cycle, followed by two 3 T-state MWrite cycles; a total of 11 T-states. In your listing, which also shows a total of 11 T-states, T6 is the first T-state of the first MWrite cycle and T9 is the first T-state start of the second MWrite cycle. Since your listing only shows status when the clock is high, there's is no visible difference between T5 and T6. Had you listed the clock low states as well, you would have seen the /MREQ line activated at T6 low (and T9 low), indicating the start of a new MRead or MWrite cycle (in this case an MWrite cycle). No surprises here; exactly as documented. The reason for the 5 extra T-states when B 0 is that the Z80 needs to execute an ALU cycle to decrement the PC by 2 (to repeat the same LDIR instruction). It has to 'burn cycles' to do that since it can't overlap the decrement operation with the next instruction. When BC = 0, the PC is already pointing to the next instruction, so that M-cycle is not needed. Zilog documents this instruction T-states as 11 (4, 3, 3). As your listing shows, the first four T-states is the M1 opcode fetch cycle. No status lines are active for the next 7 T-states. These are separate ALU cycles needed to add the ss register's lsb to register L and the ss register's msb to register H. In my research the shortest ALU cycles is 3 T-states; the longest is 5 T-states. It appears that, during an ALU cycle, the address lines contain the PC's current value and the data lines are in a high-impedance state, although I haven't confirmed this in all cases. There's a lot to comment on here! The SRL (IX+20h) instruction is one of the Z80's 'double prefix' instructions, 4-byte instructions that begin with the prefix pair DDCB or FDCB. What makes these '(IX+d)' and '(IY+d)' instructions so interesting is the order of the four bytes: the two prefix bytes, followed by a d displacement operand, followed by the instruction's main opcode. The d displacement operand occurs *before* the main opcode(!). Furthermore, as your listing confirms, while M1 cycles are used to read the two prefix bytes, an M1 cycle is *not* used to read the main opcode; instead a standard memory read cycle is used. What that means is that this class of instructions generates only *two* refresh cycles while executing (the R register is only incremented twice), since only the prefix bytes, not the main opcode, is read using an M1 cycle. M1 cycle to read the DD prefix. M1 cycle to read the CB prefix. MRead cycle to read the d displacement operand (20H). MRead cycle to read the main opcode (38H) and calculate IX+20H. MRead cycle to read (IX+20H) and perform the shift. MWrite cycle to write the result to (IX+20H). Your example uses the undocumented instruction 'srl (IX+20h),b', which writes the shift operation's result to both (IX+20h) *and* register B. But the sequence of machine cycles and T-states for 'SRL (IX+d),r' is identical to that for the documented instruction, 'SRL (IX+d)', so the above squence would apply to both. 1) The Interrupt Acknowledge (INTAck) cycle is 7 T-states long, including the two automatically inserted wait states (T2 and T3 in your listing). My emulator incorrectly generates only 6 T-states for the INTAck cycle, not 7. 2) The PC is pushed onto the stack (two 3 T-state MWrite cycles) *before* the interrupt service Routine (ISR) address is read from the in-memory interrupt table (two 3 T-state MRead cycles). My emulator incorrectly performs the MRead cycles *before* the MWrite cycles. It's a bit difficult to determine in your listing where one M-cycle ends and the next one begins because you only list the active status lines when the clock is high; it would be easier to find those splits if you showed both the clock high and clock low states. MWrite cycle to push the MSB of the PC onto the stack. address from the interrupt table and assign it to the PC lsb. and assign it to the PC msb. This is pretty much as documented, except, according to your listing, the M1 cycle executed in response to the NMI is 5 T-states long, not 4. This actually contradicts Zilog's Z80 CPU User Manual (page 18), which shows T1 following T4 (not T5) in the Figure 10 timing diagram. The two cycles used to push the PC onto the stack appear to be standard 3 T-state MWrite cycles. I'll test this myself to confirm your results. I'm trying to wire up this project myself and I'm wondering what you meant by 5v and GND. 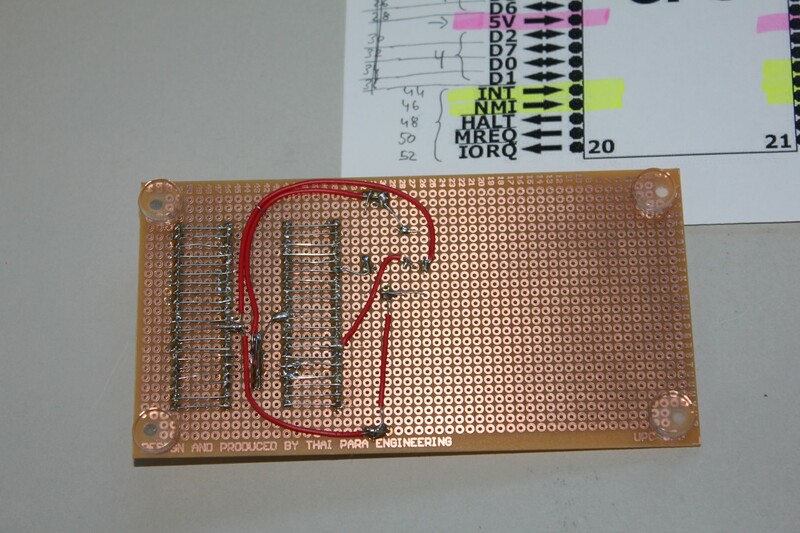 From your picture it looks like you are using the GND pin under the ICSP, is this true? Also are you using the 5v pin above the ground, on arduino because it looks like you are using another GND pin from the picture. Yes, I used GND and +Vcc from wherever I could fish them on Arduino: one GND connects to the ICSP GND pin only because I just happen to use that jumper wire (F-F). All grounds should be connected, so you can use any other GND pin. There were no other reasons. There are only a few rules (correct power + 3-state sensing to connect to analog inputs), the rest you can connect any way you want to. For example, I had those ribbon cables which I wanted to keep together and not split them and hence this particular layout. Yours may be different; if you implement more address lines, you could probably run something more substantial than what fits in 256 bytes. Arduino RAM would be the limit. Watch for jumper cable connections! I found that's the weakest point as, depending on the angle they were bent and forced, the connection would be flaky. If I'd ever do this again, I'd build an Arduino shield-type of board instead just to solve that problem. Hi Goran , thanks for the quick reply. I looked at the pictures more closely and figured it out. I'm currently fully connected and have the software uploaded and am getting this output (http://imgur.com/ou30UNh) to the serial monitor. The commands that are coded in, are those to be used in the serial monitor? I'm not getting any response when hitting the commands. That looks good - you got it running! The address bus is incrementing and reading NOPs.